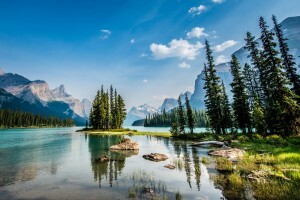 The Maligne Valley sightseeing tour between Jasper and Maligne Lake provides visitors to Jasper with some of the most remarkable views in the Canadian Rockies. Learn about the geological and historical significance of this remarkable valley by joining a friendly local interpretive guide on this daily sightseeing tour. This half-day tour includes a gentle walk along the top of Maligne gorge, multiple photo stop opportunities and is punctuate by a short interpretive walk or leisurely boat cruise to world famous "Spirit Island". 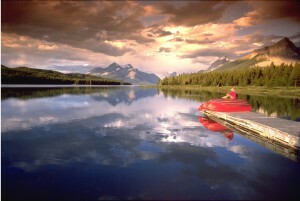 Of the 2 options available upon arrival at Maligne Lake, the Maligne Lake boat cruise is by far the most popular. The unique perspective of the surrounding mountains during this 90 minute interpretive tour aboard a glass enclosed heated boat to Spirit Island is in a word "breathtaking"! For a more intimate soft adventure, join your guide along the shores of this beautiful lake as you hike along the Mary Schaffer Loop (3.2km / 2mile – weather and trail conditions permitting). 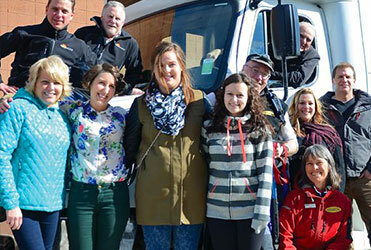 Add an incredible mountaintop viewing experience with Jasper's Tramway upon your return from Maligne Lake and save money!